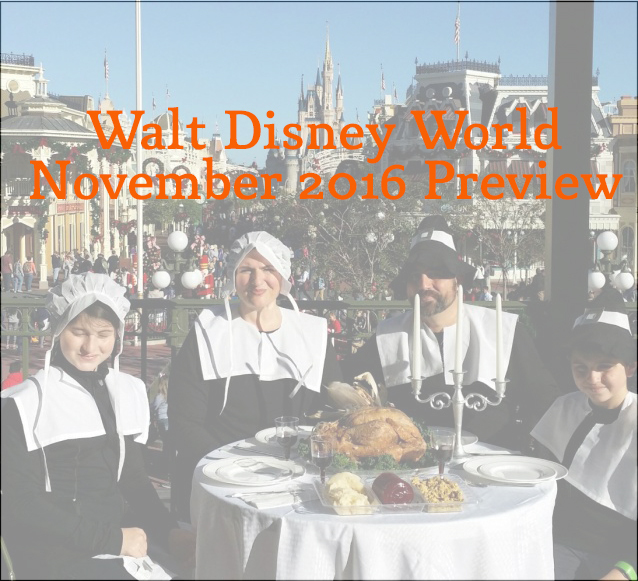 Welcome to TouringPlans’ Walt Disney World November 2016 preview – we hope your October pumpkin spicy. Who’s with us and ready for November? This month we have a little bit of everything. Thanksgiving. Food & Wine. RunDisney. The beginnings of Christmas. It’s a fantastic time to visit Walt Disney World to get the best of the weather, crowds (except the week of Thanksgiving), and holiday spirit. Ready for more? Read on. November is just lovely at Walt Disney World. We were down last week and the weather couldn’t have been better. Cool temperatures. No out of the blue afternoon rainstorms. This is the last month of hurricane season. October saw park closures and the evacuation of Fort Wilderness campsites as Hurricane Matthew approached central Florida. The storm ended up going further to the east than originally forecasted, and the parks re-opened promptly. But the damage and flooding seen along the Atlantic coast reminds us that hurricanes should always be taken seriously. NOAA’s National Hurricane Center is an excellent resource for forecasts that may affect your November trip. Disney Cruise Line saw itinerary changes on all three ships that were sailing the weekend of the hurricane, including one cruise that was canceled altogether. Additionally flights were delayed and canceled as airports closed during Hurricane Matthew. Evening temperatures drop below 60 this month, so pack layers if you have any day into night plans. There has not been a lot of news concerning Zika this month. South Florida remains under a CDC travel advisory for women who are pregnant or who could become pregnant. That advisory has not been extended up to Central Florida. Walt Disney World is providing cans of mosquito repellent in its resort rooms for guests, and there are stations at the park entrances that also provide this. The CDC is your best source for news about Zika. Every Wednesday Brian hosts a Live Facebook Q&A, usually at noon or 1pm Eastern. Check Facebook each week for the exact time. Times for all live chats are posted in advance on our Facebook page and on Twitter. 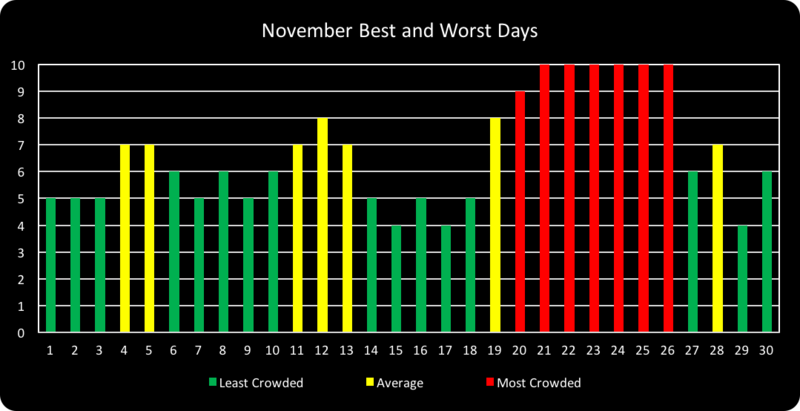 The big news in Walt Disney World crowds in November is Thanksgiving week, but the rest of the month is very manageable. For day by day park recommendations for travel during September, check out our Crowd Calendar. The Epcot International Food & Wine Festival continues through November 14. The event doesn’t really impact wait times at Epcot, but it definitely clogs the walkways. For the least hassle experiencing Food & Wine, avoid the weekends. Feeling sad that Food & Wine is coming to an end and Flower & Garden (which, let’s face it, is really Flower, Garden, Food & Wine) isn’t until Spring? Worry not – of course there’s a new dining and beverage opportunity hot on the heels of Food & Wine. Holidays Around the World Marketplace begins November 25 with seasonal foods to enjoy from kiosks at Epcot. Want to get spiffed up for your day at Epcot? Saturday, November 12, is Dapper Day. The joke is that as soon as November 1st rolls around, the Halloween decorations come down and it instantly becomes Christmas at Walt Disney World. Instant isn’t quite correct; there’s a whole WEEK between the last Halloween party and the first Mickey’s Very Merry Christmas Party on November 7. Remember Magic Kingdom will close early (7:00 PM) to day guests on party nights. The show elements for the Disney Parks Christmas Parade will film in Magic Kingdom November 9 to 13. This will mainly take place around the Castle court stage, the hub, and Main Street. The actual parade that will be shown in the TV special will be filmed solely in Disneyland. If you’re a photographer, one very interesting thing happens in Magic Kingdom in November. The Town Square flagpole is replaced with the Magic Kingdom’s Christmas tree. Why is this interesting? Because there is a brief period when neither is up, giving you an unobstructed view down Main Street from the train station. For photographers, this is like catching a unicorn. The “Halloween” ticketed event, Club Villain, has been extended “due to guest demand” through January 2017. It happens twice nightly on Fridays and Saturdays. The Disney Wine & Dine Half Marathon Weekend is November 3 – 6. The half marathon is now a day race, instead of the “logistically and meteorologically challenged” nighttime race that it once was. The post-race party is still held at Epcot starting at 10PM after the half marathon. Guests may see extra traffic around Epcot the mornings of the races. If you see a runner wearing a finisher’s medal medal while you’re here. definitely give him or her a high five. Most full service restaurants will offer a traditional American Thanksgiving meal on Turkey Day. If you’re having problems snagging a reservation (and you will need one) – try our Dining Finder with text alerts to increase your chances of getting in. Of course, the best Thanksgiving ever is still the one in the Magic Kingdom with our own Steve Bloom and his family. There are no current general public discounts for Walt Disney World for travel in November. 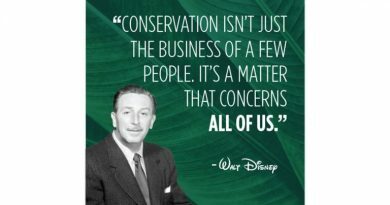 Check the Featured Offers section of Disney’s web site for all discounts. There are several discounts for late 2016 to early 2017 (not including the week of Christmas and New Year’s) that can be booked now. Passholder and Florida Resident Discounts: Room-only discounts are available for stays November 6 to 10, 13 to 22, and 26 to December 23. Details here (pass holder) and here (Florida resident). We still don’t know what’s up with Rivers of Light at Animal Kingdom. Work on Rivers of Light was delayed (even more) by Hurricane Matthew in October. We heard rumblings that the show may be previewed “soon” for Disney upper ups. You can see lots of progress to the RoL viewing area at Animal Kingdom. It looks very nice. For any updates on Rivers of Light follow us on Twitter. PizzeRizzo should open this month at Hollywood Studios in time for the busy holiday season. Jingle Bell, Jingle BAM debuts well before Thanksgiving, on November 14, with a holiday-inspired projection show on the Chinese Theatre at the Studios. Princess Elena takes up residence at Princess Fairytale Hall in Magic Kingdom beginning November 24. Disney’s Wilderness Lodge Villas have been renamed Boulder Ridge Villas at Disney’s Wilderness Lodge. 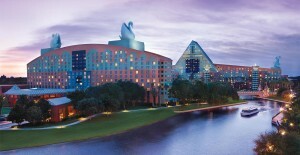 Two Starwood properties, the Walt Disney World Swan and Dolphin, share space at Crescent Lake with the Disney-owned Beach Club, Yacht Club, and Boardwalk resorts. They offer spacious, modern rooms with nearly all the perks of the Disney resorts. The biggest reason to stay at any resort in this area is location. 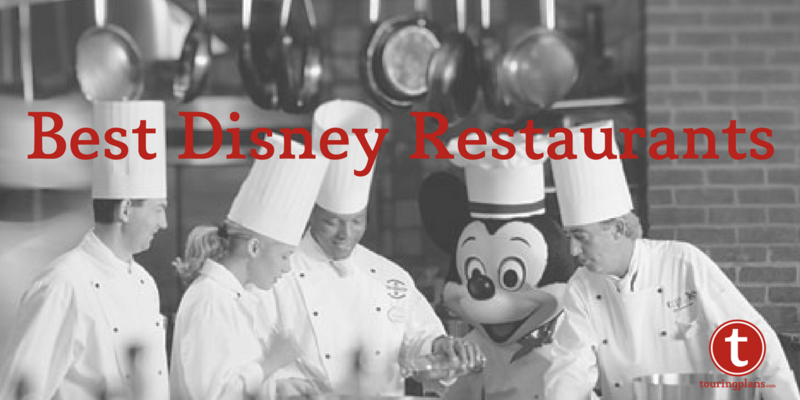 Guests can walk or boat to Epcot or Disney’s Hollywood Studios. And dining options are plentiful and various. The Swan and Dolphin share a beautiful pool complex, complimentary bus transportation on Disney’s bus system, and are across the street from Fantasia Gardens Mini Golf. Rates at the Swan and Dolphin are often less expensive than those at the nearby Disney-owned resorts, though there are some gotchas to be aware of. There is a fee for parking and a resort fee is added to your nightly bill. Guests at the Swan and Dolphin receive free parking at the theme parks, 60-day advance FastPass+ reservations, Disney transportation within the resort, and Extra Magic Hours. They are not able to use Magical Express to travel to the resort from Orlando International Airport, nor are they able to book the Disney Dining Plan with their rooms. Seth Kubersky talked Thanksgiving week crowds last year. Derek was generally thankful around this time last year. Want to take your holiday to the seas? Laurel wrote about Thanksgiving on Disney Cruise Line. Back in 2011, Scarlett Litton decided to try something beyond the bird with Thanksgiving dinner at Cape May Cafe. Created a trip in our trip planner to get news that impacts your vacation dates? Used our Ticket Calculator to get the best prices on park tickets? Used our Room Request Tool to find and request the best hotel rooms at your resort? Planned your days to get the most out of your time? TouringPlans subscribers have access to all this and more and get timely reminders when they create a trip on the site. And it’s all easy to find on your Personal Dashboard, a central location for all your travel plans that all subscribers see when they log in. It even has a checklist, so you’ll know what you’ve crossed off and what’s left to do before your vacation. We hope you have a great vacation. Let us know how it went when you get back by taking our user survey. It helps travelers just like you know the best (and the rest) of what to do, see, ride, and eat at Walt Disney World. Thanks for reading this month! Mickey’s Very Merry Christmas Party starts on the 7th, not the 27th.